Welcome to Costa Cruises, a holiday at sea offering you an endless choice of opportunities, both on board ship and ashore. You can have as much freedom as you want on a Costa cruise holiday, because you can tailor your holiday to suit you. Enjoy the freedom to spend your morning relaxing on board, from early morning tea in bed to lazing on a deckchair in the sun then losing yourself in the spa and the freedom to step ashore at the next exciting destination to see the sights or perhaps do some shopping. You are free to start your day with a leisurely breakfast in your cabin, in the restaurant and buffet or al fresco. There is freedom to create a holiday which is entertaining, relaxing or cultural, or even all three! You have freedom to do as much or as little as you choose, all you have to do is decide just what you want from your cruise holiday. And it is also great value for money, with so much included in you holiday price – from welcome aboard pizza and ice cream to a wide variety of activities from learning the language of love to Italian cooking classes! 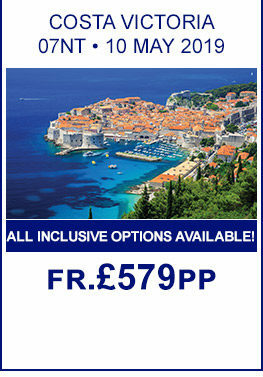 A Selection of our best Costa Cruises Offers! Overnights in Madagascar & The Seychelles! , All Inclusive Options Available! , Dates Available Nov - Mar 2019/20/21 , £446pp SAVING! Was £1845!!! Overnights in Mumbai and The Maldives! , Dates Available Nov - Mar 2019/20/21 , £1242pp SAVING! Was £2641pp!!! All Inclusive Options Available! , Dates Available Nov - Mar 2019/20/21 , £446pp SAVING! Was £1845!!! FREE Hotel Stays in Venice and Fort Lauderdale! , All Inclusive Options Available! 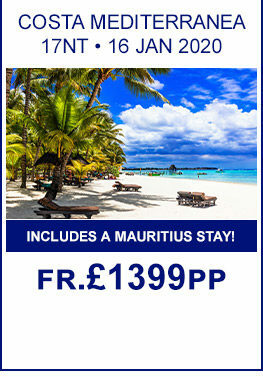 , £259pp SAVING! Was £1706pp!!! Overnights in Mauritius, The Seychelles & Israel! , FREE Hotel Stays in Mauritius & Venice! Overnight in Abu Dhabi! , Includes a 3nt Stay in Dubai! FREE 2nt Barcelona Stay! , All Inclusive Options Available! , Extend Your Stay in Dubai! Book Now! When it's Gone - It's Gone! , All Inclusive Options Available! 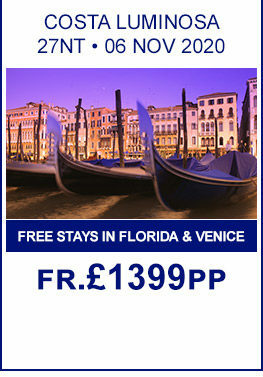 FREE Hotel Stay In Venice , Book Now! When it's Gone - It's Gone! FREE Oceanview Upgrade! , Book Now! When it's Gone - It's Gone! Overnights in Palma & Ibiza! Overnight Stay in Lisbon! , FREE Hotel Stay in Marseille! Overnights in Mauritius & The Seychelles! , All Inclusive Options Available! Overnights in Mumbai and The Maldives! FREE 2nt Hotel Stay in Mumbai! 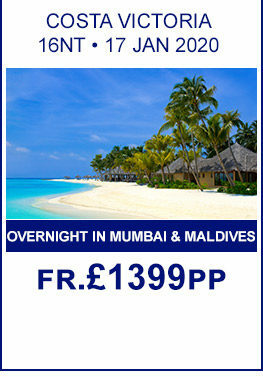 , FREE 3nt Maldives Stay!